Super Soup!! BSBP Reveal #2! I am sooooooo excited!! I can't wait to hop around and see what everyone has made for their Bead Soup Blog Party reveals! Lori Anderson has done it again, and set a gorgeous table for everyone to feast at. If you aren't familiar with the BSBP, please check out Lori's blog Pretty Things and read allllll about it. I want to extend a huge thank you to Lori, who has done such an incredible job with this, and who has given us all such a fantastic opportunity, both to work outside of our own personal 'boxes' and to meet friends all around the world. And now... get ready, set... go!! 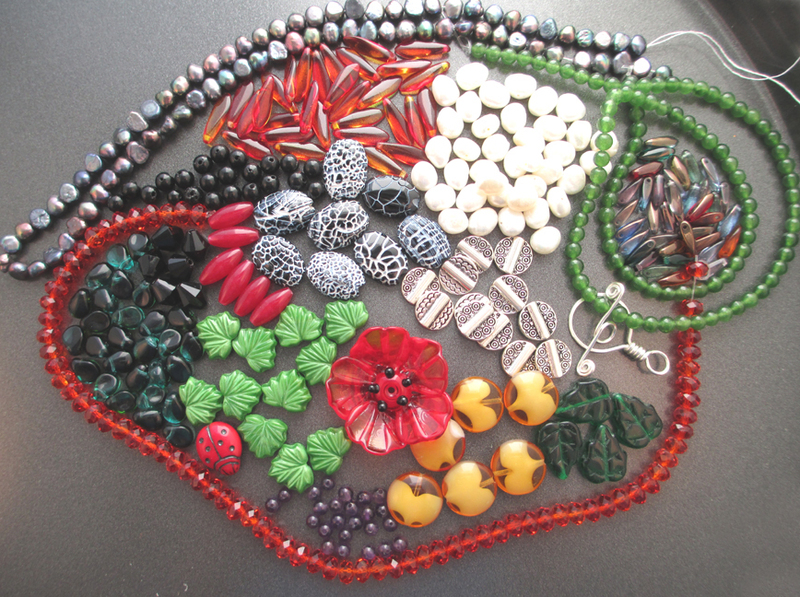 I couldn't find a way to include everything I wanted to in one piece, so I have created two necklaces to use as many beads as I could. I apologize to Bobbie that I wasn't able to use all of them... but the ones that got left out are just simmering in my stash, waiting for the perfect time. The focal was embroidered onto a small piece of stiff stuff, then backed with ultra suede and brick stitched on the edging. I added two more rows of brick stitch, and then some picots and fringing. 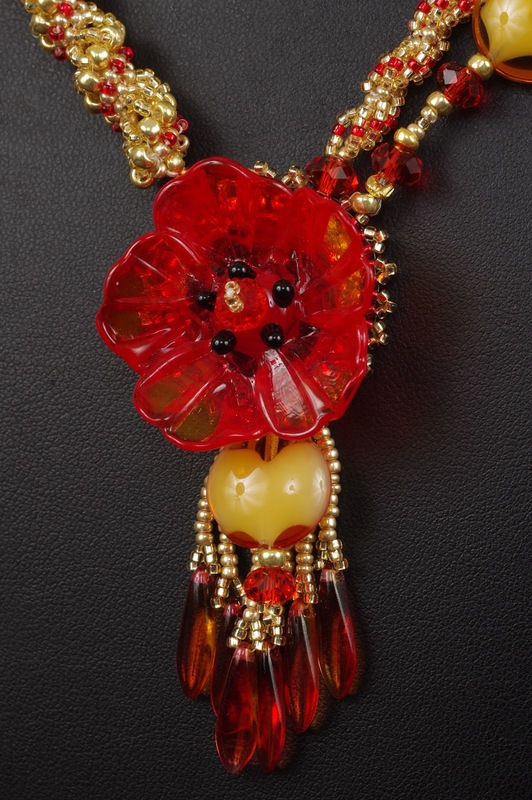 The lentil bead and crystal are a second layer of fringe right below the flower, to match the 3D effect of the lampworked flower. On the right side of the necklace, I made a simple spiral rope with crystal inclusions, and a strung rope with the lentil beads, seed beads, and more crystals. 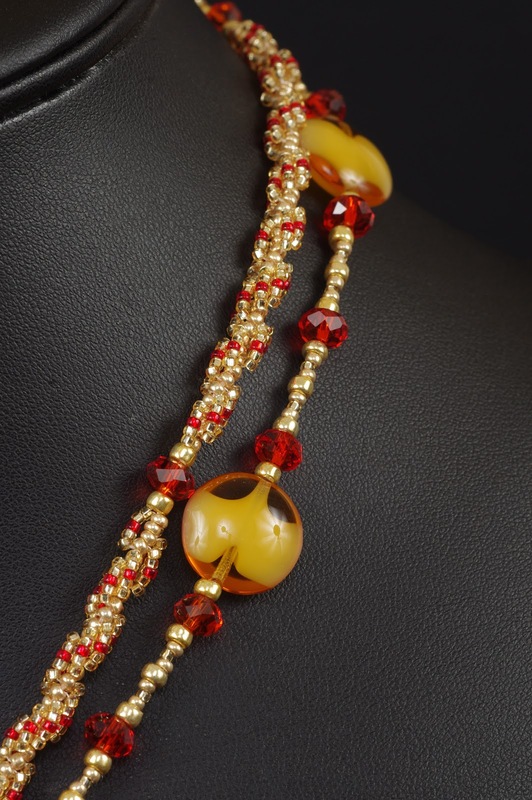 I think it balances with the other side fairly well, and I like the mix of textures, with a small spiral, larger beads and spaces on this side, and a continuous large rope on the other side. On the left side, I used a Dutch spiral stitched rope (something I hadn't done in years, again!) and then embellished along the completely gold rope with tiny red seed beads to highlight the spirals. I finished this one with a clasp I had in my stash, because I felt like it really needed something flowery to balance the front. 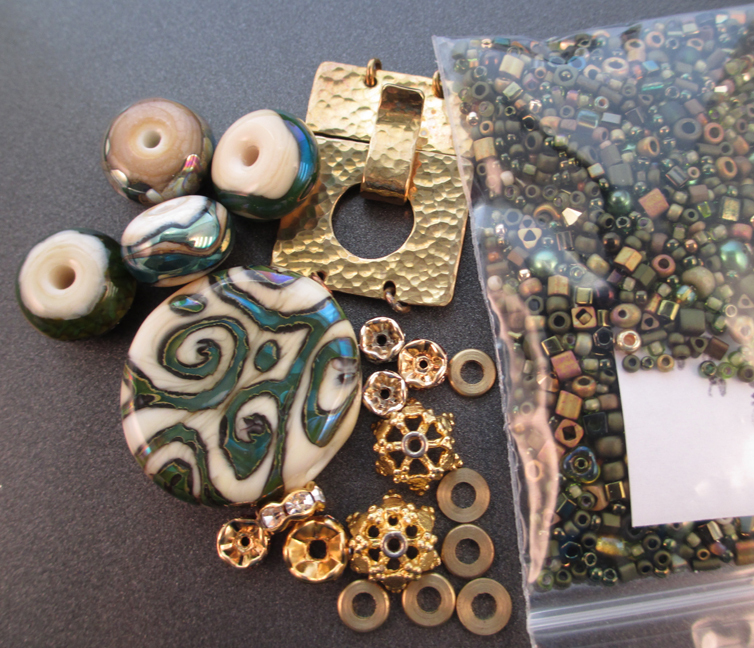 I wanted to be able to put this piece up for sale in my shop, but unfortunately discovered three quarters of the way through beading that the size 11 beads I was using were apparently galvanized, as the gold finish was flaking off. Oooooooooo, grrrrrrr!!! 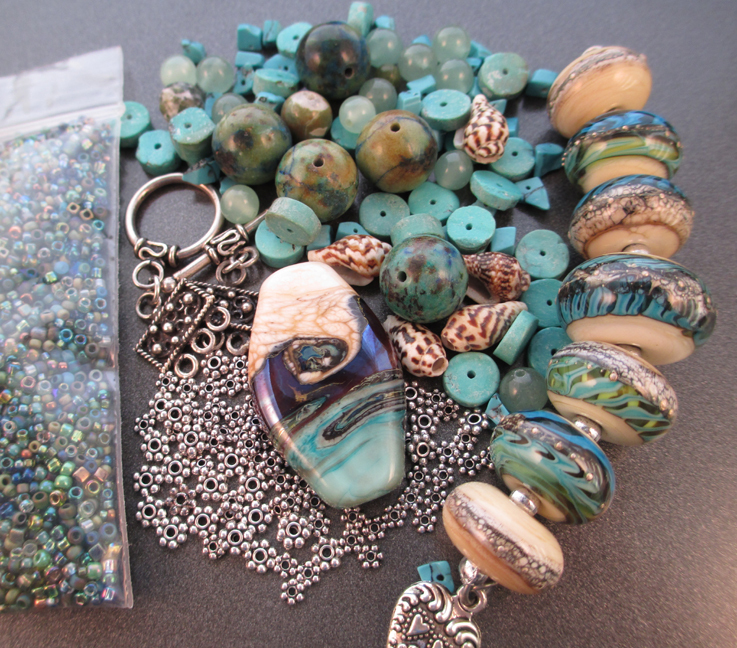 I thought I had rid myself of all of the galvanized finish beads in my stash, but apparently I missed some. :( So, it will have to be a 'for show' piece, but that's ok too, as it's pretty to look at and gave me some new ideas for other designs, as well. Between the colors themselves and the stitches I chose, this one really stretched my creativity in many ways!! For my second piece, I just HAD to use those incredible freshwater pearls, and the gorgeous clasp Bobbie made for me (by hand!! She made it by hand!! 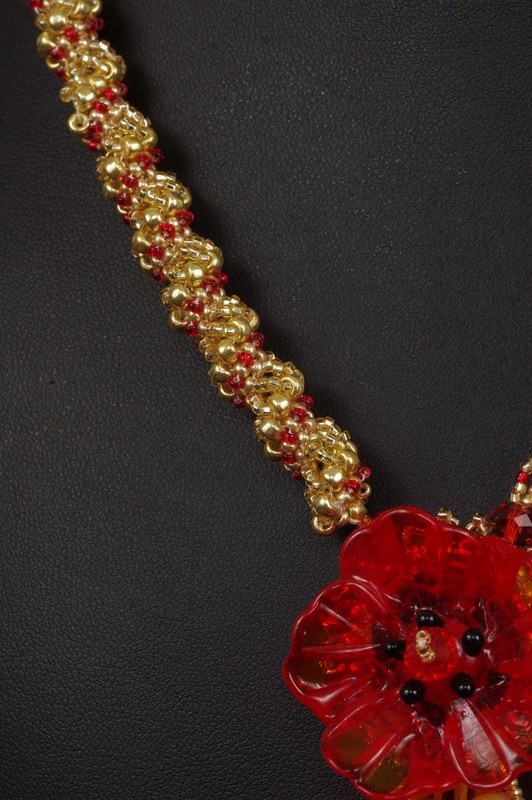 I am totally envious, I can't do wirework to save my own life). 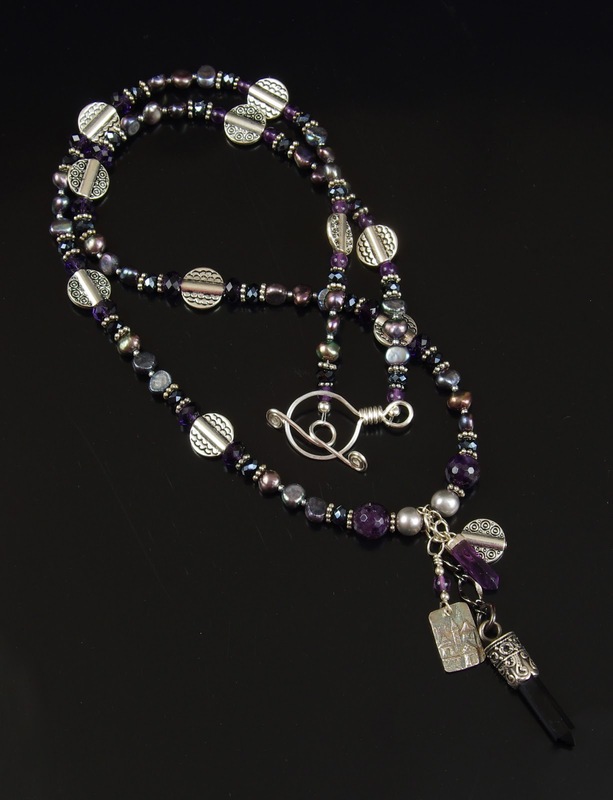 So, of course, the amethyst and the pewter had to jump in too... and I decided to use a little of my bali silver, some cubic zirconia rondelles, two large silver grey freshwater pearls, and two large faceted amethyst beads at the center. I enjoyed my stringing so much (rusty as I was!) 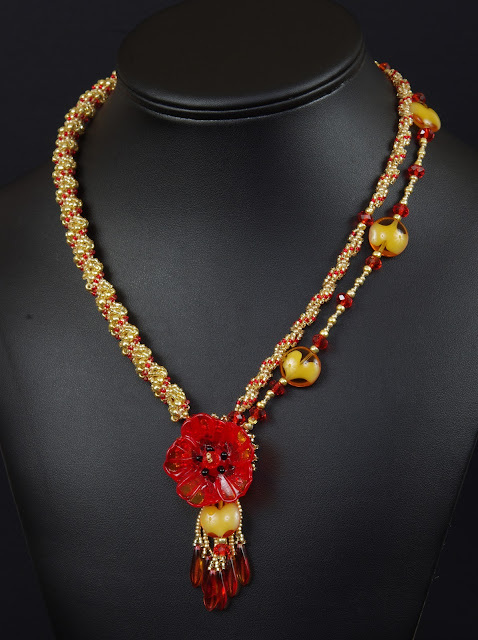 that I decided to string this piece, too. This one was a creation for just me, made with some of my very favorite things. Below is a closer up photo of the pendants I added. The longest hangs from a gunmetal chain rather than a silver one because I felt like it highlighted the tarnished silver of the pendant, and is a black onyx point that I've had for ages. It's a special pendant to me, as it was a gift from my mom. The smaller point is amethyst, and it is accompanied by two more 'fringes', one of which is a piece of the pewter Bobbie sent me, and the other of which is a handmade charm by Andrew Thornton. I adore Andrew's charms, little medieval 'cities' that just make me happy. I hung it from an eyepin (yes, I did that horrible wrapping job myself) with sterling and amethyst. And, of course, I had to include a beautiful close up shot of Bobbi's wire work sterling clasp. Isn't it perfect?? I hope I did it justice. I really love this necklace, I've worn it several times already, and it swings and sways and makes a lovely little chinking noise when I move. Thank you sooooooo much, Bobbie!!!! 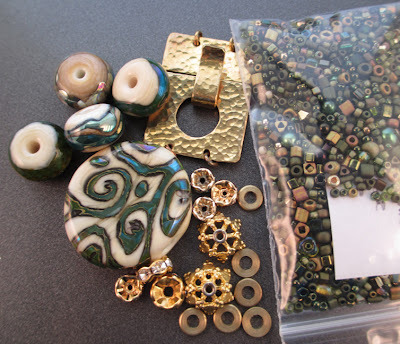 Now, you MUST visit Bobbie's blog and see what she has been cooking up with the bead soup I sent her. Her work is fabulous and she is MUCH better at blogging than I am - she actually posts often, rather than my regrettable once every month or two, lol. Here are the two soups I sent off - photographed by Bobbie again because she made them look much yummier than I did... I can't WAIT to see how she chose to use them!! Please take the time, and a cup of your favorite beverage, to go to Lori's blog and hop around to all of the other reveals - I know I will!! Click HERE for the list!